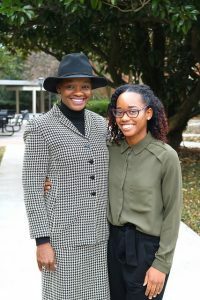 When DeKalb Early College Academy (DECA) senior Hannah Huff wrote down her thoughts on two of her favorite works of literature—Alice Walker’s short story “Everyday Use” and Langston Hughes’ play Mulatto—little did she know she would soon find her work published in a scholarly journal. 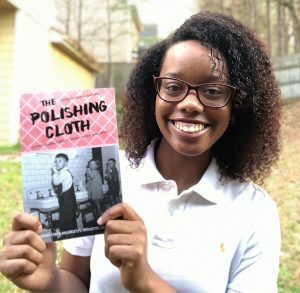 Huff’s work, Identity in Langston Hughes’ Mulatto and Alice Walker’s “Everyday Use”, was recently published in the 24th edition of The Polishing Cloth, Georgia State University Perimeter College’s literary journal. Huff’s work also won The Polishing Cloth’s Essay Award at an official award ceremony. Huff’s entry into the contest began as nothing more than an assignment in her 11th grade English class. Her teacher was so taken with Huff’s work that she suggested it be sent to The Polishing Cloth for publication consideration. The pair never guessed it would not just be published, but also earn the literary journal’s Essay Award. Identity in Langston Hughes’ Mulatto and Alice Walker’s “Everyday Use,” draws comparisons between the two works’ protagonists. In Mulatto, Huff focused on Robert, the son of a white man and a black housekeeper. She saw connections to Dee, an educated black woman seeking to embrace her African roots. Huff’s analytical mind couldn’t stop her from seeing a common thread. Huff began studying both works intensely. This included reading various reviews about each work and continually taking notes on sentiments that stuck with her. This feeling is something Huff can relate to. At DECA, Huff said she has encountered peers from many different backgrounds, such as Nigeria, and admires how proudly they display it. Huff is proud to be an African-American, but struggles with how broadly that can be interpreted or shown. By continuing to explore these themes through writing in the future, Huff hopes to leave the world a much better place than she found it. Huff credits DCSD with inspiring a sense of curiosity and self-reflection—two attributes that helped her pen such a noteworthy work. Huff’s time spent at Princeton Elementary, Wadsworth Magnet School for High Achievers, Chapel Hill Middle, and DECA have introduced her to inspiring teachers, healthy learning environments, and lifelong peers. “I love it! I’ve always felt safe. The teachers are phenomenal. I still keep in touch with one teacher from Princeton,” Huff said. In her spare time, Huff also enjoys writing poetry, stream-of-consciousness compositions about romance, and more. She hopes to take her talents to Oglethorpe, Emory, University of Georgia, Harvard or Duke, where she plans to major in neuroscience. Upon graduation, Huff will have 60 college credits. When it comes to replicating her success, Huff’s advice is simple: just go for it.